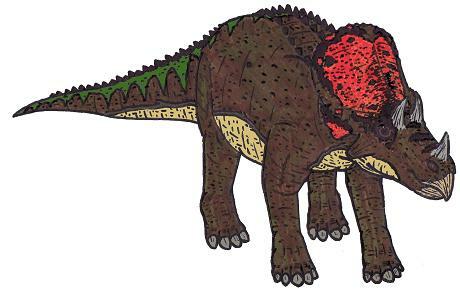 Avaceratops was comparatively small compared to most other Ceratopsian dinosaurs, about 7½ feet (2,3 meters) long. Like other Ceratopsian dinosaurs, Avaceratops had a neck frill, however unlike most of its relatives, the neck frill was solid, with no openings (fenestrae). The lack of fenestrae is in fact a feature also found in Triceratops, so it is possible that Avaceratops was ancestral to Triceratops. The first fossils of Avaceratops were found in the Judith River Formation in Montana by Eddie Cole in 1981. The animal was formally named by Peter Dodson in 1986, its name being partly in honor of Cole's wife, Ava - its name means "Ava's horned face". North American Dinosaurs - Avaceratops lived in North America. Avaceratops was a genus of dinosaur. It is possible that Avaceratops was an ancestor to Triceratops. "Avaceratops" means "Ava's horned face" - it is named after Ava Cole, the wife of its discoverer, Eddie Cole. Avaceratops was a member of the Ornithischia ("bird-hipped") order of dinosaurs. What this means, is that although Avaceratops was not closely related to birds, it did have similarly shaped pelvic bones. Avaceratops was a Ceratopsian - a member of a group of related herbivorous (plant-eating) dinosaurs with beaks, many of which had neck frills and horns as well. Avaceratops lived between about 80 million years ago and 75 million years ago, during the late Cretaceous period. Avaceratops lived in North America. Avaceratops was a herbivore (plant-eater). Avaceratops was about 7½ feet (2.3 meters) long. Avaceratops weighed about 700 pounds (320 kilograms).